Fast, efficient, and comprehensive TotalWeb Partners Website Design & Build offers include professional design guidance, copywriting, on-going analysis, and on-going updating from TotalWeb’s professional team. TotalWeb’s staff will learn about your business to create the best possible online experience for your customers on both traditional and mobile devices. No special quoting is required as costing is quick and easy with TotalWeb’s menu driven services for basic sites as well as a full suite of optional modules. TotalWeb Website Production Services include innovative design processes for swift implementation with optional hosting and on-going update services. Customer Service Module; Google Translator, Live Chat, and FAQ pg. 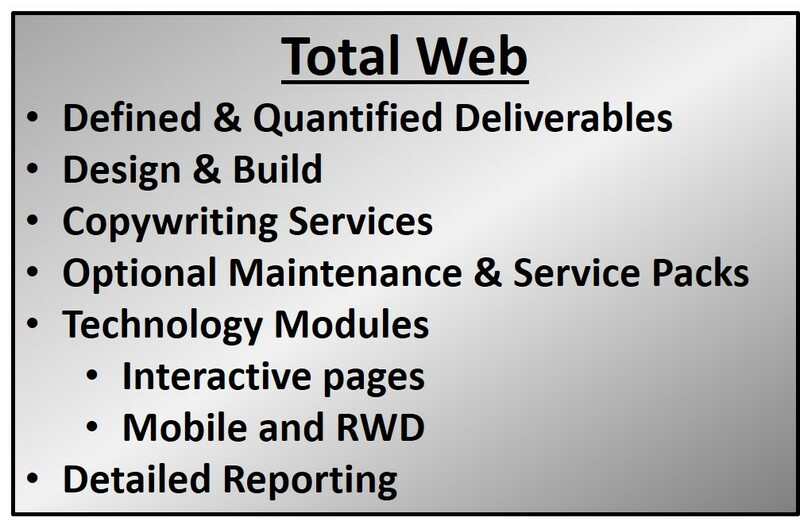 TotalWeb Partners Website design and build offers are comprehensive and straightforward with no hidden fees. TotalWeb Partners offers are comprehensive and straightforward with no hidden fees. Strategically focused comprehensive national & regional packages. Includes site design and upgrading, SEO, Social Media, E-marketing, unique content creation and & optimization, and expert consultation.